Of Books and Blooms: Floret Farm's Cut Flower Garden + A Giveaway! Do you remember me mentioning my excitement about a book coming out from Floret, a blog I've been stalking for a few years now? The book is here! I got a very fun box in the mail from Floret that included the book, plus a few freebies--a calendar, a couple of seed packets, and a postcard. YAY! I sat right down and read it in 2 days. It was so good! I'll have more to say about it in just a minute. Then 2 days ago, another package came in the mail, this one from Amazon. I opened it up. Another copy of the book. Wait, what? I was so confused! To be honest, I am still baffled. I think I must have pre-ordered on the Floret website AND from Amazon, but I have absolutely no recollection of doing so. Um....? Can I blame it on pregnancy and move on? I think so. Anyway, however it happened, and as much as I love this book, I do not need 2 copies for my personal library! So I get to share with one of you lucky people! Just to whet your appetite, let me tell you about it. 5 stars: Loaded with practical information, gorgeous photos, and helpful tips. A winner! Erin Benzakein lives and grows flowers on a 2-acre farm in Western Washington. Her farm provides wholesale cut flowers all over the region, bouquets for weddings and special events, and also does all kinds of things to promote the sustainable, local, cut flower movement. In addition to the blog, they host workshops, give interviews, write articles, etc. On her website, Erin (I feel like we're on a first-name basis) explains that this is the book she wishes she had when was she just starting out ten years ago. It is geared for the beginner, but there's so much information in it that even seasoned gardeners will learn something from it as well. Don't think you have to have aspirations to become a flower farmer yourself to enjoy this book. 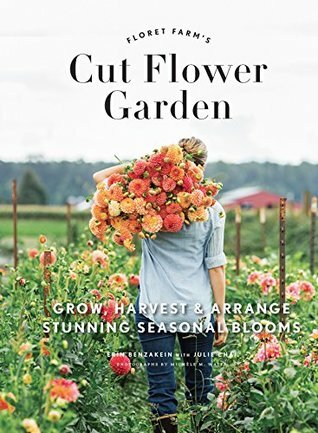 If all the space you have to dedicate to cut flowers is one garden bed, or even a couple of flower pots, this book has the information that will help you make the most of that space. Those ready to take on more will find tips for scaling up as well. So it starts with the basics: assessing your site, deciding what to plant, preparing the soil, dealing with weeds, and so on. There's a section called "Essential Techniques" that walks you through starting seeds, providing support for your flowers, pinching, and what to do with flowers after you've picked them to extend vase life. There's a section on Tools. Then at the end, she has 3 projects to make with flowers in bloom that season. For instance, one of the spring projects is a flower crown, and one for winter is a garland. The projects include step by step instructions, with photos to help illustrate each step. Did I mention the beautiful photography? Many, many, color photos throughout the book, showing life on the flower farm, illustrating concepts, etc. Some serious eye candy going on here. What makes this book different from most I've read is that it isn't just about the gardening or the floral design. It's both. It's tips for growing your flowers efficiently and productively, then what to do with them once you've cut them. I will say the practical information is more weighted on the side of growing the flowers vs. floral design, but hey--once you've got all these pretty flowers growing, playing around with them is the fun part! Again, you don't have to be a professional on either side to get started. Just get in there and get your hands dirty! Also, please leave an email address so I can reach you if you're the winner! I will choose a giveaway winner on St. Patrick's Day: Friday, March 17. Linnae! I have been wanting this book, and now even more after your wondeful review! One of my fondest memories of flowers is when I was a girl and we lived in Maryland. One year my mom wanted Black-eyed Susans on the side of our house so my dad let me help him plant them (not sure how much help I was). They still make me smile whenever I see them. Hey Megan! Glad you're putting your name in the hat! :) Black-eyed Susans are such cheerful flowers--and so hardy, too. Got to love that! I still remember our snowball bush in Idaho. We would pick off the big round flower heads and let all the smaller florets "snow" down around us. Good times! I need to plant more bee loving flowers so our bees don't have to travel so far. Especially ones that bloom in the summer when there is not as much pollen for them to find. Got any tips? Bee balm (monarda) is always a winner. I've also noticed the bees LOVE a lot of the herbs: my oregano bush is crawling with bees all summer, as is the catmint. My favorite flower right now is centranthus ruber (Jupiter's Beard). Thanks to you figuring out the name for me, I was able to finally get some in my front flower bed. It bloomed for the first time last year, but it was still a little scraggly. I can't wait for it to fill out in the next year or two! I love that it's drought tolerant and keeps its bloom through the summer. Yes! I remember trying to figure out what that was on our walks! :) It's supposed to be a real butterfly magnet--have you noticed that with yours yet? And drought tolerant is always a plus--the less I have to drag around the hose in the summertime, the better! Watch out--gardening is addictive! Ha! Salsa gardens are fun. In your climate, I would imagine all those peppers and tomatoes and things would grow quite happily without much intervention needed.